Having um’d and ur’d for days about buying a ticket to see HMS Pinafore at the Octagon Yeovil, I stopped procrastinating and booked my ticket. I felt quite excited (my ‘going-out’ days having been severely restricted since having children!). The night arrived; all of family fed and watered; time to go. I felt like a woman on a mission rather than someone going out for a pleasant evening; as always I had not managed to leave the house on time and combined with my non theatrical appearance (necessitated from child friendly wardrobe i.e. jeans, joggers, sweat-shirts, etc), it felt more like a trip to the BNI breakfast meeting. So I tried to psyche myself up with Classic fm on the radio as I drove asfast as I safely (and legally) could, to avoid missing the opening scene. The car park was packed but only minor panic set in as I eventually found a space at the far end. There was an air of relaxed anticipation as groups and couples made their way through throngs of happy banter that was filling the foyer. Looking around the auditorium, I couldn’t help but notice the average age of the audience was around 70 years old, although there was just one family there with two boys aged around 10 and 16 apiece. That seemed a pity to me. There was however, an interesting array of dress style and colours; none of your formal theatre gear here; anything from plain jeans and open necked shirt to Jaques Vert suits; each row was multicoloured, hardly any blacks or greys in sight. I personally felt it looked a bit spooky, almost skeletal; like rib and limb bones being dangled from above, but that is probably because it was so close to Halloween! There was a background noise that didn’t register with me initially but I soon realised it was a recording of the sea lapping up and over the shingle and stones of a beach; Lyme Regis perhaps. That wonderful whooshing sound as the wave rushes into shore and is then dragged back into the ocean, trying to scoop as many loose stones as it can manage on its return journey. We didn’t have to wait much longer as the drummer appeared on stage, right on cue, the lights dimmed, let the show begin! Opera Della Luna, a Bicester based touring company of around 12 artists managed to set the scene straight away with lots of activity all at once; simulating ships moving, waves rising and falling and the general hubbub of a ship coming into shore. From that point on, there was something to engage the audience every step of the way as five performers moved seamlessly to the side of the stage to form the orchestra. The singing was high spirited and enthusiastic and the words left you in no doubt as to what sort of personality you were dealing with. The foundations of this simple love story quickly unfolded with a mixture of songs and drama. Della Luna’s portrayal of the lovelorn couple along with the other characters that were an important part of the plot, made it a simple task of identifying with the characters’ plight and understanding just what they were going through. Every character was vital to the performance, even those that arrived half way through such as Sir Joseph Porter and his family, were just as important as Captain Corcoran who was there from the start; and it was this vitality that helped produce such a high level of entertainment and managed to not only grab the audience’s attention but easily maintain our interest. There were, I suspect, a few little Della Luna nuances for I doubt very much that Gilbert and Sullivan would have made Sir Joseph Porter something of an admirer of Able Seaman Ralph Rackstraw’s physique! I can’t help but question the wisdom of this approach and wonder about the value of adding the modern day embellishments of sexual preference to this classic, but then perhaps I’m being a bit too stuffy! One of the many aspects I enjoy about this kind of entertainment is that there are no possibilities of retakes, no chances of the camera being able to lie and any mistakes have to be masterfully disguised as part of the performance. This is proper acting, the real McCoy. So if you have an opportunity to go to the theatre, don’t prevaricate, pick up the phone and book yourself a ticket and enjoy the raw spectacle of a live performance! 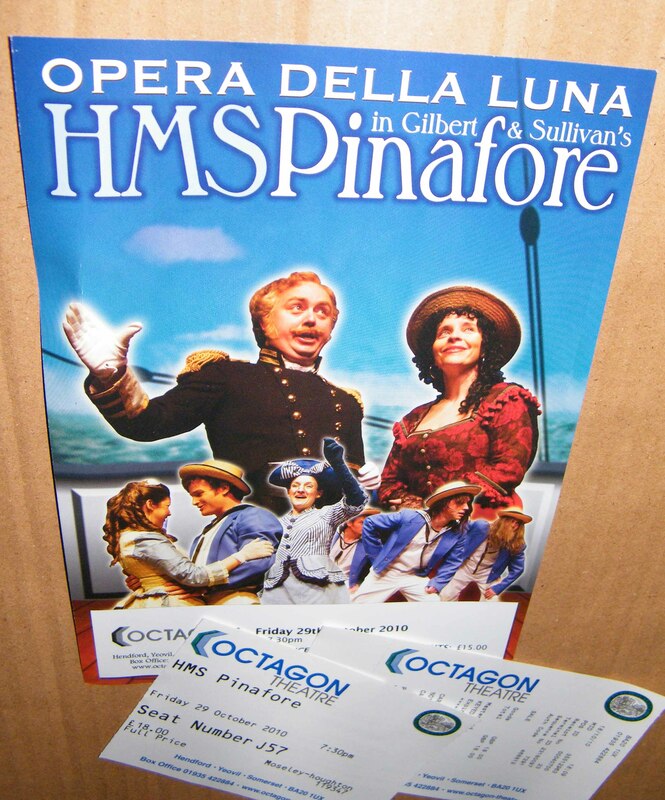 This entry was posted in Entertainment and tagged Gilbert & Sullivan, HMS Pinafore, light opera, Octagon, singing, stage performance, theatre, Yeovil. Bookmark the permalink.